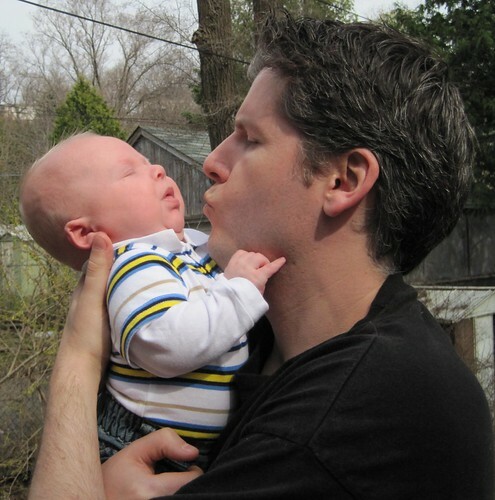 Back in September of 2007, my wife tried to sell me on having a third child. Her argument was a good one. We had created two amazing kids, why not create a third? I somehow managed to convince her we were done growing the family, and I didn't hear another word about having a third kid until Sunday. That was the day after my wife held our new nephew for hours and hours. With the baby in our family about to turn six and my wife soon to hit the big 3-5, my wife eloquently and passionately argued her case as to why we should have a third kid. She did this during our Scrabble game, ensuring I was a captive audience. Clever girl. Don't get me wrong, I'd be a lucky SOB to have a third kid and I'd love him/her to pieces, but I'm pretty sure I'm done. I've been blessed with the two greatest kids in the world and everything is absolutely perfect as it is. My 18 yr. old twins were born when I was 34 & actually we thought of having another but when results from tests on our DNA (placenta) were done & told we would have a 75% chance of having a multiple birth our mind was made up. It's both your decisions & I'm sure both James & Michelle would love another. I was in the same situation mike. Our two boys were 2 years apart and the youngest was just approaching 1-1/2. My wife told me she always wanted 3 kids, but I said I was perfectly happy with the size of our 4 person family. We had a 3rd. And my daughter is the twinkle in my eye. She has me wrapped around her pinkie, she just doesn’t realize it yet. The last picture on this entry says it all!!! Come on DAD. Don't do it Mike - the world doesn't need another liberal. I'm sure that will now be your inspiration to get your wife knocked up. Just kidding...I'm sure whatever you guys decide will be great! ...happy wife = happy life!